They say a hair of the dog that bit you will cure a hangover. Colleen Graham, Guide to Cocktails, tells us what causes a hangover (the two biggest being dehydration and toxins), but how do you cure one? Eating burnt toast, black coffee and fatty foods are all myths, the pundits say. But eggs can help mop up liver toxins, bananas will assist in recouping lost electrolytes, water combats dehydration and the sugar energy and vitamins in fruit juices will rebuild the supply depleted by drinking. The only real cure for a hangover is time, but here's what over indulges in Eastern Europe eat the morning after. Margatyna's Northern Bularian Tripe Soup. © Margatyna, used with permission. In Bulgaria, a popular alcoholic quaff is rakia, also spelled rakiya or rakija. It's a clear alcohol similar to brandy, made by the distillation of fermented fruits. It has a high alcohol content and home concoctions sometimes exceed 60%, making it a potent drink. Rakia is usually drunk with appetizers known as meze and salads. Then wine or beer is consumed with the rest of the meal. All this alcohol makes for one big hangover in the morning. If you spot someone in a cafe holding their head while breakfasting on tripe soup (skhembe chorba) and drinking cold beer, you know they had a little too much rakia the night before. Others believe ayran (also known as airan), a sheep's milk yogurt mixed with water and salt similar to, is an essential hangover cure, while others think honey (which helps break down alcohol) or herbal tea is the way to go. Cheese Burek. © 2011 Barbara Rolek licensed to About.com, Inc.
Julia Jaksic a Croatian-American chef from Employees Only in New York City thinks the best hangover cures are Serbian-Bosnian dishes like burek. "All the (dough) soaks up the alcohol left over from the night before," she says, "and the oils from the cheeses and meats help line the stomach so the absorption of alcohol into your system will be slower. A mix of breakfast and lunch, it tastes so good the hangover blues will disappear," Jaksic says. Czech nightlife is vibrant with pubs galore in large towns and cities like Prague. Popular bar noshes are obložené chlebíčky or small bites (baguette slices with cured meats and cheeses, cream cheese, fish pastes or Italian-style potato salad known as vlašský salát and topped with capers, pickles, deviled eggs, brie, mozzarella, tomatoes, pepperoni). Popular beer snacks are utopenci, which literally means "drowned men" (sliced sausage pickled in vinegar with onions) and topinky (toasted or fried bread, sometimes with toppings). But the morning after, Garlic Soup or česnečka is de rigueur. A rather obscure and revolting Hungarian hangover cure is drinking sparrow droppings in brandy. Yikes! More palatable remedies are to eat fried bread, known as lángos, generously rubbed with a cut clove of garlic, and night owl soup or korhelyleves. This soup is a hearty combination of sauerkraut and smoked meats. Many Eastern European hangover cures revolve around soup -- not only is it warm and comforting, the liquid rehydrates the brain and body. Sauerkraut Soup. © 2010 Barbara Rolek licensed to About.com, Inc. The hangover-relieving effects of sauerkraut and boiled cabbage go back to the ancient Egyptians and are one espoused by Lithuanians and other Eastern Europeans. In Lithuania, it's known as raugintu kopustu sriuba. Eaten with a thick slice of Lithuanian rye bread, it's said to work miracles. Lithuanian sauerkraut soup is nearly identical to Polish kapuśniak. Polish Ryemeal Soup or Zurek. © 2009 Barbara Rolek licensed to About.com, Inc.
Poles love their wódka, piwo and nalewka. Many a young fellow (or miss) can be seen at one of the cafes around Krakow's Jagiellonian University with head in hands while nursing a bowl of zurek. Zurek, known as white borscht, is a rye-based sour soup that's traditionally served at the end of a wedding to sober up the guests. Other favorites include kapuśniak, chicken soup known as rosół, and tripe soup known as flaki or flaczki. Pickle juice is another common cure-all. Over consumption of alcohol depletes the body of salt, and the juice helps replenish it. Some drink soured milk (not buttermilk) and eat pickled herring (again the salt thing). Romanian Cabbage Ciorba or Sour Soup. © 2010 Barbara Rolek licensed to About.com, Inc.
Like Bulgarians, Romanians chase their hangover blues away with tripe soup, known as ciorba de burta (similar to Polish flaczki). Ciorbas are sour soups. Romanian tripe ciorba is a salty affair made with root vegetables, garlic, vinegar, and cream. If tripe isn't your thing, Romanian sour cabbage soup or ciorba de varza will do the trick. Russian / Ukrainian Solyanka Soup. © 2010 Barbara Rolek licensed to About.com, Inc.
For Russians, pickle juice or sauerkraut juice is a must for hangovers. And, if it's fizzy, all the better. Rassol is a carbonated sauerkraut juice that is now available in cans! Talk about progress. The juice helps to replenish lost electrolytes, so maybe there's some truth to this folk remedy. Pro athletes drank it before Gatorade came on the market. Other remedies are to eat black bread soaked in water, take a sauna or just go on drinking! 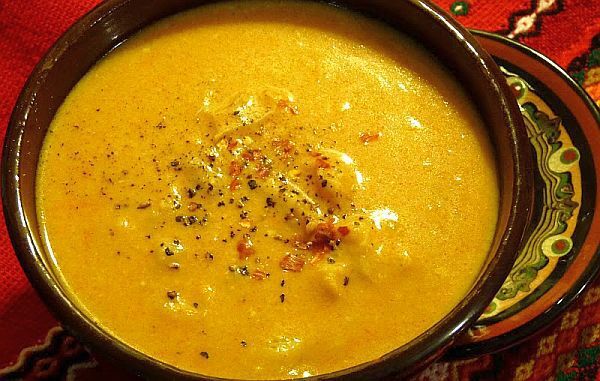 Two of the more palatable cures are solyanka, a salty soup loaded with smoked meats, and another soup known as rassolnik. RU-21 was originally developed in Russia to keep KGB agents sober while they got their contacts schnockered to divulge secrets. It ended up being a hangover cure that entered the U.S. market in 1999. It is said to work best taken before or while drinking to prevent the morning hangover. Another cure, allegedly invented by Tsar Nicholas II, is the nikolaschka, which can either be a cocktail or unusual "snack" of lemon slice topped with sugar and ground coffee ate in one bite and washed down with vodka or brandy. Turkish Coffee. © 2011 Barbara Rolek licensed to About.com, Inc.
My friend swears by a strong cup of Turkish coffee. But burek (see the Croatian remedy, above) and a cold glass of are popular cures. Slovak Garlic Soup or Cesnačka. © Amy_Richardson on Flickr. In Slovakia, mať opicu means literally "to have a monkey," but is slang for a hangover. Honey, tea and garlic soup (cesnačka) are all recommended. Try the Czech recipe, above, or make a quick version by crushing garlic with salt in a soup bowl. Add a little bacon grease, more salt and pepper and boiling water. Add a bit of grated garlic on top, if you dare! Ukrainian Beet Borscht. © 2011 Barbara Rolek licensed to About.com, Inc. Sour soups are the most common Eastern European hangover cure. For Ukrainians, it's borscht or solyanka or schav. A glass of pickle juice is highly recommended, while others drink a non-alcoholic fermented yeasty beverage known as kwas, which is also popular with Poles.